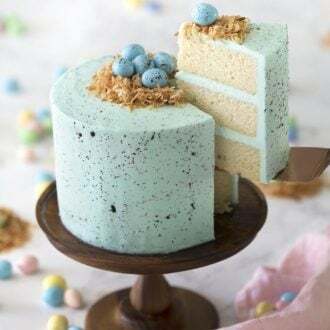 This moist and delicious white chocolate cake is covered in a beautiful ombré of indulgent white chocolate buttercream and dusted with colored sanding sugar for a bit of wintery sparkle. 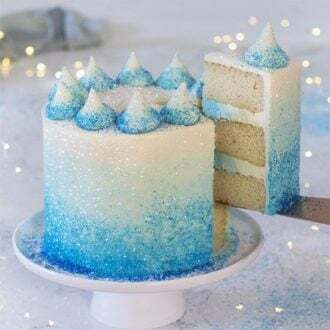 This Winter Wonderland Cake has ombréd EVERYTHING!!! It’s covered in this amazing white chocolate buttercream and then rolled colored sanding sugar to complete the effect. 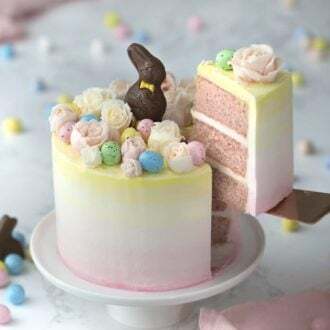 I’ve made this cake a few times and you can add an icy, blue-white chocolate ganache for some extra contrast if desired! Be careful when melting that white chocolate. It burns VERY easily so go slow with low heat. In a rush? Skip the ombre buttercream! The sanding sugar will do most of the work visually. Making an ombre is super-easy. Just mix in different amounts of the same color of food coloring to get the gradient. Can You Add White Chocolate Chips to the Cake Mix? 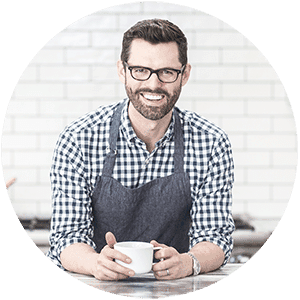 You can add 1/3-1/2 a cup of mini chocolate chips or roughly chopped regular chocolate chips. Here is a different version of the cake I made. It has a ganache drizzle and dollops piped with an 869 tip. Which do you like better?? How Do You Make White Chocolate Cake? 1. Preheat oven to 350F. Butter and flour three six inch cake pans. Sift the dry ingredients, including the sugar, together in a large bowl, whisk and set aside. 2. Mix the wet ingredients together in a medium bowl and whisk together. 3. Add the wet to the dry and mix until just combined. Divide the mixture into the three 6″ cake pans that you buttered and floured. I also use wet cake strips for nice even baking. Bake at 350 for about 30 minutes or until the centers are springy to the touch. 4. Melt the white chocolate and cream together at very low heat, set aside. I like to heat my cream up and pour onto the white chocolate. let sit a minute then whisk together. 5. Beat the butter until light and fluffy, add the sugar a cup at a time and beat well. Add salt and vanilla. 6. Drizzle in the white chocolate and beat until combined. 7. 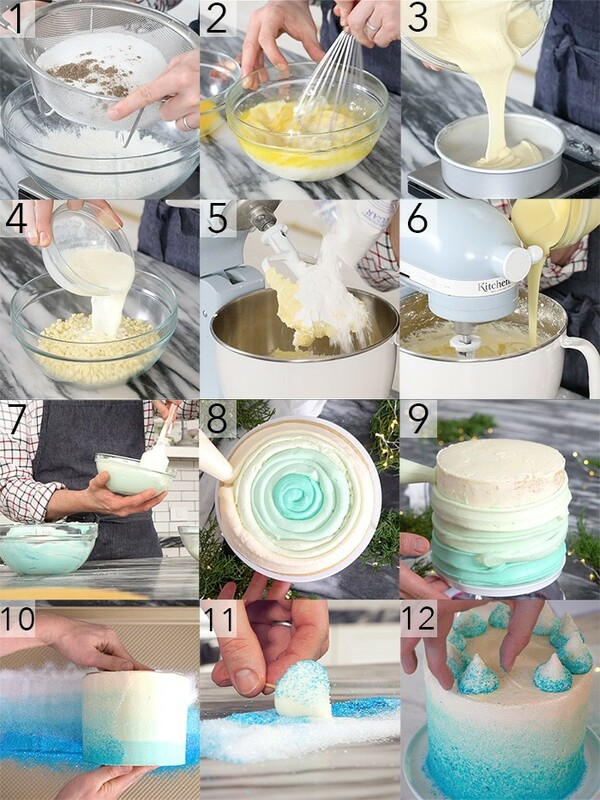 Separate the buttercream into 4 equal batches and color three of the batches with blue food coloring in different shades for the ombré. 8. Place a round of cardboard onto the bottom of a cake layer. Pipe the buttercream onto the first layer of the cooled cake. I like the inside to be an ombré as well but you can have any color(s) you’d like. Add second layer on and repeat step until cake is built up. Add a thin layer of buttercream onto the cake, smooth then chill to set. 9. Pipe the final layer of buttercream onto the cake starting with darkest blue and moving to uncolored on top. Smooth and chill the cake once more. 10. Place parchment round on top of cake. 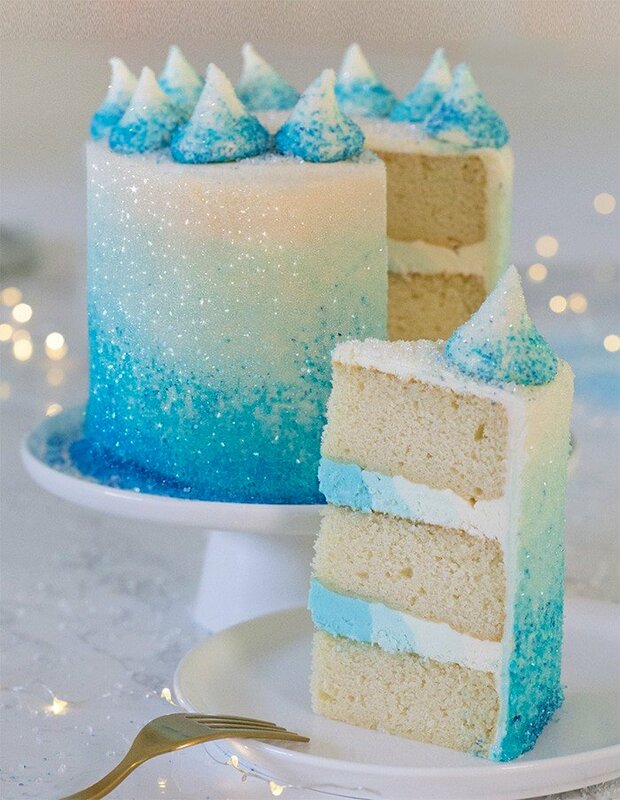 Add a gradient of blue sanding sugars onto a clean surface then roll the chilled cake and transfer to a cake stand. 11. Pipe dollops onto a square of parchment paper using a large round tip. transfer to freezer and chill. Once set you can mount onto a toothpick and roll inn a small gradient of sanding sugar. 12. 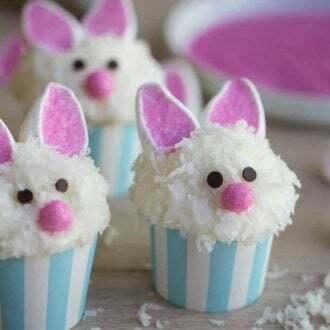 Place dollops onto cake sprinkle to with white sanding sugar. 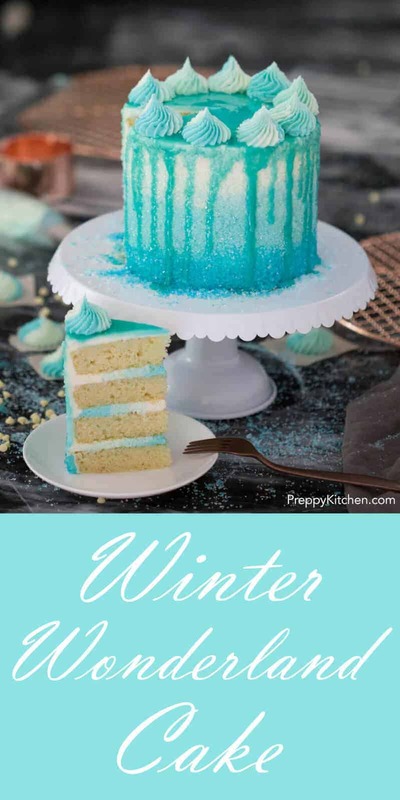 White chocolate buttercream, the best vanilla cake ever and ombré everything make this cake the perfect winter treat! Preheat oven to 350F. Butter and flour three six inch cake pans. Sift the dry ingredients, including the sugar, together in a large bowl, whisk and set aside. Mix the wet ingredients together in a medium bowl and whisk together. Add the wet to the dry and mix until just combined. Divide the mixture into the three 6″ cake pans that you buttered and floured. I also use wet cake strips for nice even baking. Bake at 350 for about 30 minutes or until the centers are springy to the touch. Melt the white chocolate and cream together at very low heat, set aside. I like to heat my cream up and pour onto the white chocolate. let sit a minute then whisk together.Beat the butter until light and fluffy, add the sugar a cup at a time and beat well. 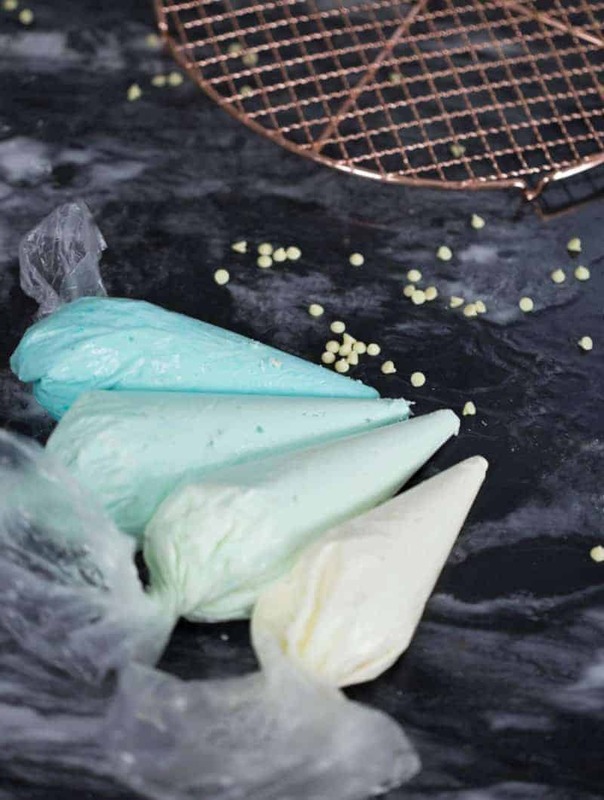 Add salt and vanilla.Drizzle in the white chocolate and beat until combined.Separate the buttercream into 4 equal batches and color three of the batches with blue food coloring in different shades for the ombré. Place a round of cardboard onto the bottom of a cake layer. Pipe the buttercream onto the first layer of the cooled cake. I like the inside to be an ombré as well but you can have any color(s) you'd like. Add second layer on and repeat step until cake is built up. 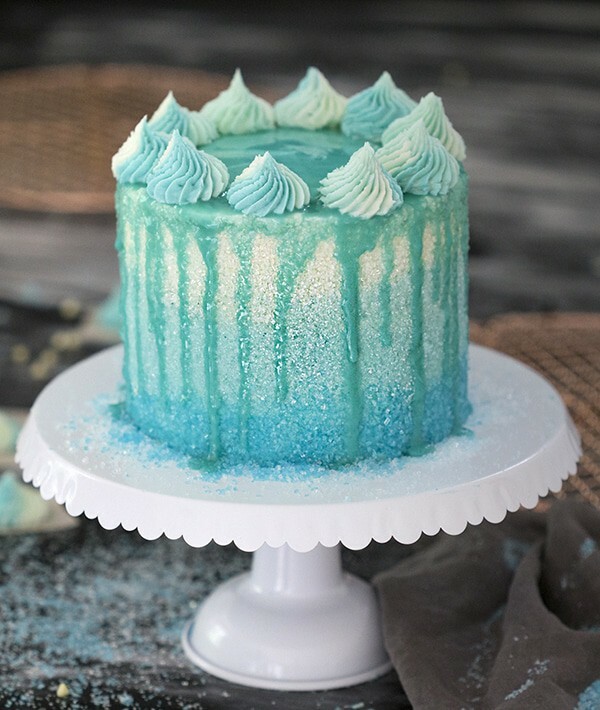 Add a thin layer of buttercream onto the cake, smooth then chill to set.Pipe the final layer of buttercream onto the cake starting with darkest blue and moving to uncolored on top. Smooth and chill the cake once more. Place parchment round on top of cake. 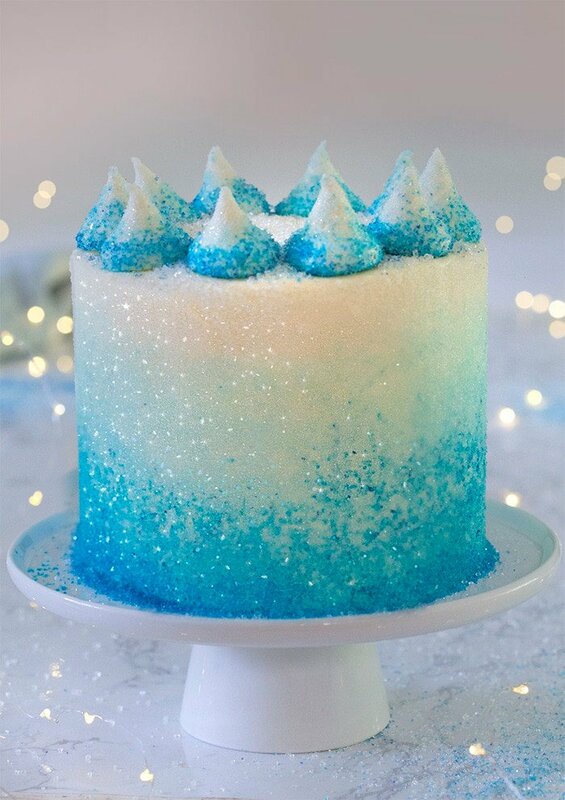 Add a gradient of blue sanding sugars onto a clean surface then roll the chilled cake and transfer to a cake stand. Pipe dollops onto a square of parchment paper using a large round tip. transfer to freezer and chill. Once set you can mount onto a toothpick and roll inn a small gradient of sanding sugar. 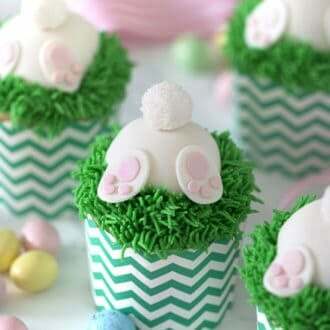 Place dollops onto cake sprinkle to with white sanding sugar. If adding a ganache grip, just place the dollops on after the drip has set. Can you tell me how many people a 4 layer 6 inch and a 4 layer 8 inch cake will serve?